Summer’s End Panzanella Salad - What the Forks for Dinner? 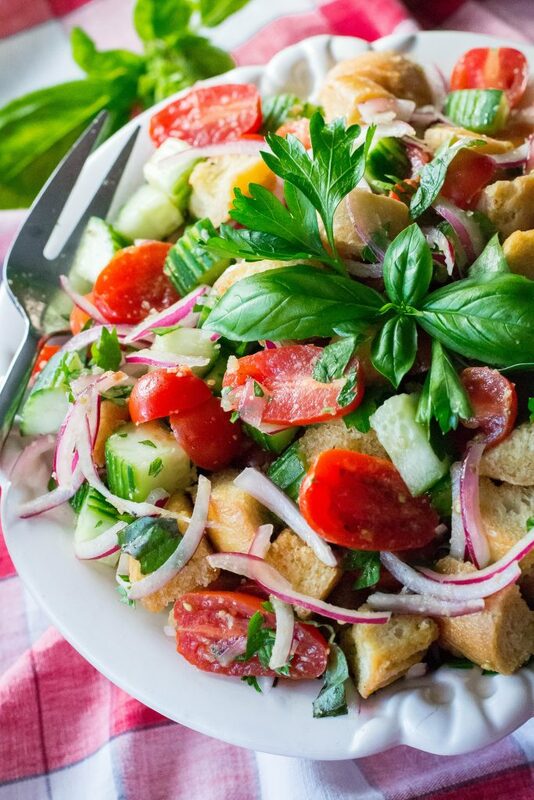 Panzanella or bread salad is Tuscan in origin. 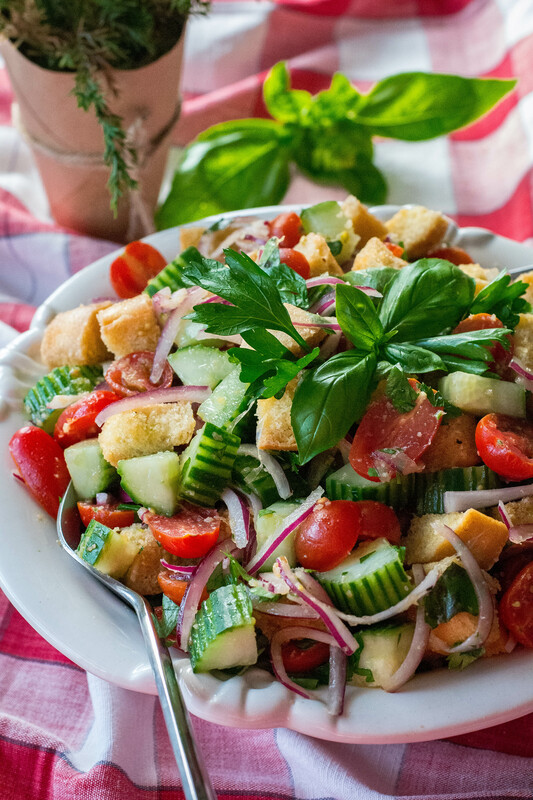 Popular in the summer in Italy, chunks of stale bread, tomatoes, onions, and basil are dressed with a simple olive oil and vinegar vinaigrette. In the 17th Century panzanella was bread soaked in water, squeezed dry, then mixed with veggies from the garden. 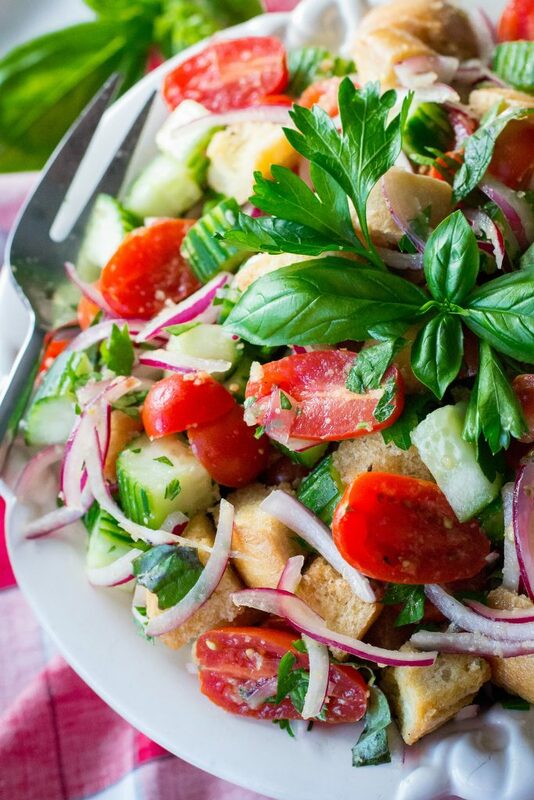 Fast forward 100 years and tomatoes were not available for everyone and panzanella was made mainly with onions. 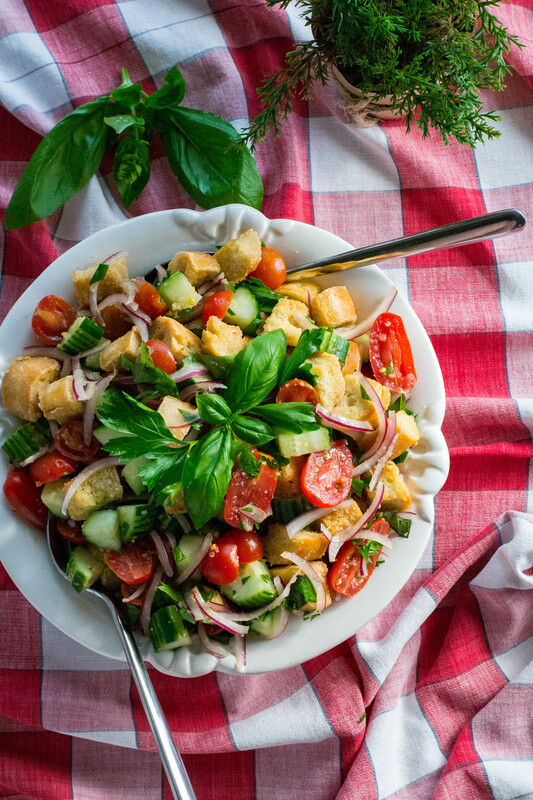 In 1865 panzanella was served to a King to be symbolic of the Italian flag. The salad was made with basil, white bread, and tomatoes. From the twenty century forward panzanella became what we know today. The name is believed to be a blend of “pane”, Italian for bread, and “zanella”, a deep plate in which it’s was served. My adaptation is with garlic toasted bread, the traditional tomatoes, and onions, along with cucumber, basil, and parsley. With our garden nearing the end of being productive, I wanted to use the last of our bounty. As I mentioned before and judging by all the cherry tomatoes recipes I made this summer……we had A LOT of cherry tomatoes. Summer’s End Panzanella Salad let me utilize those beauties perfectly. We did not grow onions, but we did grow cucumbers….also prolifically. My basil and parsley have taken over their corners of the garden, so into the salad they went. After the first frost the basil will be ka-poot. Neat trick I learned this summer…place cut basil in a glass jar of water. Set it on your counter out of direct sunlight…. it lasted several weeks. Basil hates the cold, so don’t put it in the frig. I used day old french bread, but you can use any stale bread you have on hand. Cube the bread and toss with olive oil and buttered garlic, then place on a cookie sheet in a 350 degree oven for 15 minutes or until toasty brown and crunchy. Toasting the bread keeps it from getting soggy. The rest of the salad is chopping the veggies, and making a light simple vinaigrette of olive oil and vinegar. I chose red wine vinegar, but use your favorite. All the veggies, bread and herbs are tossed with the vinaigrette and either served right away or you can allow the salad to set for up to a half an hour. Use up the remaining bounty of your garden with this delicious salad. 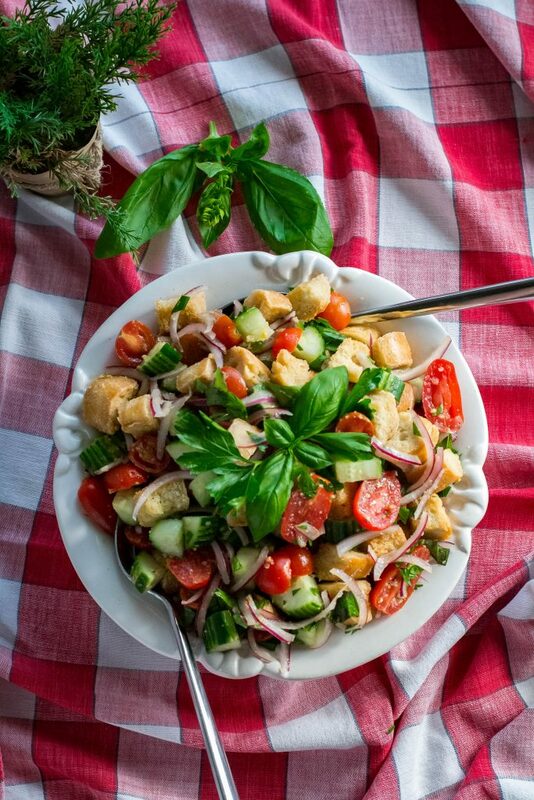 Summer’s End Panzanella Salad can be a light supper or paired with your BBQ favorites. Place cubed baguette on a large baking sheet. Mix together 1/2 cup of olive oil with melted butter and garlic. Drizzle mixture over bread cubes and toss to coat bread. Place in oven and bake for 15 minutes or until the bread is golden brown, stirring about half way through to brown evenly. Remove from oven and set aside to cool. 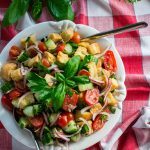 Combine vinegar with 3 tablespoon of olive oil, salt and pepper and pour over the salad and mix well. Add toasted bread and parsley, and basil toss to coat and mix in the herbs. Can be served immediately or prepared 15 – 30 minutes in advance.